So sang Jim Lowe in 1956, in a song that epitomizes the experience of the excluded, of the Outs who wish they were In. It’s a universal aspect of the human condition, no doubt, this feeling that someone else is having a better time than you, and that if you could just get beyond the Green Door – whatever form it takes – then your happiness would be complete. Writers experience it quite starkly, for every published writer was once an unpublished writer, pressing his or her nose up against the glass and pining for recognition; but human discontent assumes many shapes. C. S. Lewis wrote a very insightful essay on this subject called “The Inner Ring”, and if you only have time to read either this post or that essay, I recommend you choose the latter. 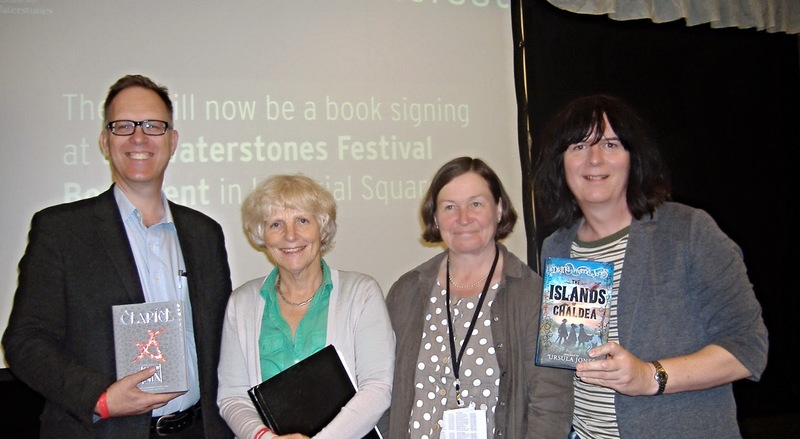 Well then; last Sunday I went to the Cheltenham Literary Festival to take part in an author session. It was only my second visit to the Festival – to my shame, for it’s less than 50 miles from Bristol, an easy trip up the M5 or by direct train. But small efforts can be more daunting than big ones, as you know. My first visit was a few years ago, to hear Alan Garner. On that occasion I was very much a fan, standing happily in the signing queue with my copies of The Owl Service and Elidor. In fact I found myself next to another author in the shape of both halves of Tobias Druitt. Garner’s a writer’s writer, I think, so meeting other authors there was not surprising, but because he signs in a careful calligraphic script his queues move slowly. There was plenty of time to chat. Last Sunday was different. This time I was a stand-in for Ursula Jones, who was herself a stand-in for her sister Diana Wynne Jones. 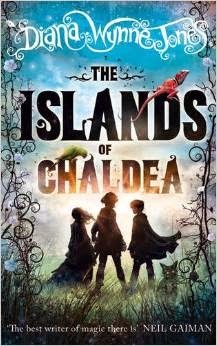 When Diana died in 2011 she left a not-quite-finished novel, The Islands of Chaldea, which Ursula was asked by the family to conclude – and conclude it she did, quite masterfully in my opinion. 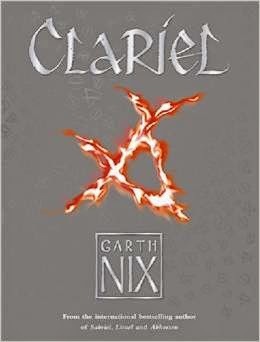 The plan had been for Ursula to do an event “in conversation” with the Australian fantasy writer Garth Nix, who’s on tour promoting his excellent new book Clariel, but unfortunately she had to pull out at short notice. I was suggested as a replacement, since I know Diana’s work well and had been consulted about The Islands of Chaldea in the early stages. Unfortunately I wasn’t able to spend much time in Cheltenham's Authors' Tent, and since I was driving I was unable to indulge in the free beer and wine, but I did stop for a few minutes to eat a scone and take in the scene around me. Writers sat here and there, chatting merrily. Some I recognized, some I felt I ought to recognize, but all looked entirely comfortable – and who wouldn’t, in a setting that was in itself a comforting reassurance that, “Yes, you have arrived”? In one corner a crèche of authorial children frolicked, and everywhere the tireless employees of the Festival served, cleared up, replenished and gave a general masterclass in the anticipation of whims. They were all fantastically cheery and helpful. They were so helpful, in fact, that I began to feel a little suspicious. Could they really be that anxious for my happiness? Anyone who’s spent as much time as I have pondering “Hansel and Gretel” knows that there’s no such thing as a free lunch. Might the scone be drugged? Would I wake to find myself chained to a gang of midlist authors in one of GCHQ's notorious data mines? But no such calamity ensued. “Ooh, a bowl of miniature chocolate bars!” I exclaimed as I was getting ready to leave. “May I take one?” They were Green & Black, after all. “Take several!” they exclaimed. “We’re so grateful you were able to come!” Though I peered closely, I could detect no trace of irony in their expressions. They really seemed to mean it. A wise and poignant post and link, Cathy, as ever, let alone that memorable and truthful glimpse of the scene beyond the next green door. I wonder whether because a writer writes in part to be heard and acknowledged, the sense of being unheard by some "inner ring" has an even sharper bite? Brilliant! Love the idea of Hilary Mantel in a hot tub with Ian McKewan and Salman Rushdie... I have been in the Author's Yurt at Edinburgh, and a few other festival author tents/rooms, and I can vouch for the fact that it still feels as if there's a glass door you're pressing your nose against. Yes, that IS Neil Gaiman siting at the sofa that adjoins yours, but he's either chatting to other famous people or texting (tweeting) and having a moment's peace - it feels quite wrong to lean across and say, "Er, excuse me..."
Oh dear! Always another mountain to climb! LOVE the line about Hansel and Gretel and a free lunch. And maybe there's a glass door "they" all press their noses against too? Once they've got out of that hot tub. Penny that's just what I was thinking - I bet the glass door just keeps on moving elsewhere. No matter how "successful" you are, there will always be that feeling of pressing your nose up against the glass. Cathy, I loved your post - it made me smile as well as think. "The quest of the Inner Ring will break your hearts unless you break it. But if you break it, a surprising result will follow. If in your working hours you make the work your end, you will presently find yourself all unawares inside the only circle in your profession that really matters. You will be one of the sound craftsmen, and other sound craftsmen will know it." I really needed to hear that! It's a great piece, isn't it? I've been in an author's green room, at the world science fction convention. Talk about being a kid in a candy store! But most writers are perfectly nice and willing to chat. Heck, I remember when George R R Martin was in Melbourne, when he was well known, but not yet huge, sitting in the hotel foyer chatting with everyone, as did classic writer Robert Bloch. Mostly I know children's/YA writers - I've met Garth Nix at conventions here. And they have to be nice, because child fans expect it. There is a magnificent, sublime episode of 'Frasier' in which exactly this experience happens to Frasier and Niles. The brother get an invitation to an exclusive spa, only to discover that there are other exclusive areas within that spa... as they manage to inveigle their way from Silver to Gold to Diamond, each successive area changes from heaven to hell as they endure the agony of feeling that they are still one remove away from perfection. Until eventually they come to a Platinum door... But I won't spoil it for anyone. Nick - I love Frasier, but I haven't seen that one. Will have to hunt it out. Sounds perfect Frasier/Niles territory!